You all know Newton’s second law of motion that says that F = m * a (Force equals mass times acceleration). This makes sports interesting, for example boxing. A heavy boxer will always punch with more force than a lightweight boxer. This is due to his high mass. Even if the lightweight boxer has more punch acceleration, it is almost impossible to achieve two times more acceleration than the heavy fighter to compensate for the extra mass. I don’t want to discuss about the energy spent on this, which is also an important parameter because it shows how much time he can deliver such punches. A karate fighter trains a lot to achieve a superior acceleration and this happens after many years of practice. Even though, each punch requires focus and setup time to punch with extreme acceleration, so basically it is unlikely even for a good karate fighter of 70 kg to punch several times in ten seconds with the same sustained force as a heavy boxer. This is the reason why K1 is not dominated by small, extremely fast karate fighters. To override such limitations, karate also focuses on hitting smart points, using the opponentâ€™s kinetic energy against him or reacting faster. 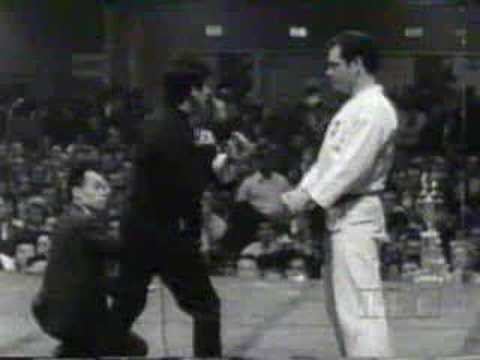 Bruce Lee had an exceptional acceleration on the punches, I am not sure that many people knew this. Anyway, this has been just a long introduction. I think that people drive results in the same way, basically Results = Intelligence * Effort. Intelligence is hard to define and itâ€™s usually not a simple thing, but a mix of multiple forms of intelligence that include creativity and knowledge also. Effort is simple â€“ how much time you work and how much you focus on your work. Iâ€™ve seen very talented guys with very poor results simply because their effort level was too low. The important thing is that the effort is like mass in the above example. Technically, itâ€™s easier to double your effort than to double the intelligence. Additionally, I donâ€™t think that the intelligence gap between individuals is so large on regular groups of people. For example, I cannot estimate whether a guy is X % more intelligent than another one, even if I worked with both for years. What I know is that there are some fields where one of them is much better, while there are others fields where the second performs better. In my experience, I have never seen a person to perform absolutely better than another person. Of course, this is technically possible, but in this case a good quality level was maintained on the group. However, Iâ€™ve easily seen people that put more effort than others. While itâ€™s also hard to estimate how much more, the results are obvious, they deliver more results than people that donâ€™t spend much effort. Sometimes, the results are impressive, like 10x more. And these results can be anything â€“ personal knowledge, personal life, work. So, it doesnâ€™t matter how intelligent you are, a very high number multiplied with a value close to 0 is close to ZERO. There are no impressive results without hardwork. Intelligence is something that no one can take away from us, the power to work hard is something that most people take away from them … on their own. I always try to keep this in mind. I would like to add that there are some studies that suggest that focus (rather than time) is crucial to achieve better results (at least in chess performance), eg its better 1 hour full focus than 4 hours multi-tasking. – its a sciam article and the study was done with chess players as it is easier to measure. High Focus and High concentration is not something easily found in this multi tasking, multi bombarded society 🙁 but High IQ guys are everywhere! … just check mensa members there are plenty.